Experience this Southern Pines North Carolina hotel offering comfortable and affordable accommodations near several North Carolina championship golf courses and Fort Bragg. Welcome to the Best Western Pinehurst Inn where guests will receive the highest quality of customer service and find unbeatable amenities for an affordable price. A golfer's paradise, this North Carolina Best Western hotel offers convenient access to 30 championship golf courses, local attractions, shopping and dining options, many within walking distance, in and around Southern Pines. Guests staying at this pet friendly North Carolina hotel will enjoy beautifully decorated guest rooms featuring cable satellite television with HBO and free high-speed Internet access. A complimentary full hot breakfast is served to hotel guests every morning. 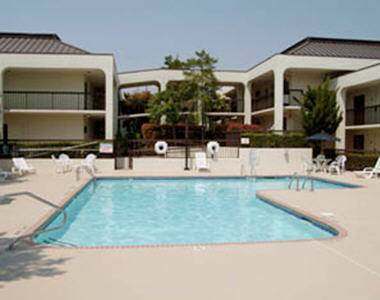 The Best Western Pinehurst Inn comes complete with an outdoor swimming pool and fully equipped fitness center. Guests traveling to Southern Pines on business will especially appreciate the on-site business center. There is no better lodging choice than the Best Western Pinehurst Inn while visiting Southern Pines. With over 30 championship golf courses nearby and an on-site hotel golf coordinator, golf enthusiasts will not be short of rounds to play. Guests can spend a leisurely afternoon exploring Historic Downtown Southern Pines and Pinehurst or catching a race at the nearby Rockingham Drag Way. Local equestrian activities and events are what bring travelers back to the Best Western Pinehurst Inn year after year. The friendly, attentive staff at the Best Western Pinehurst Inn is ready to ensure a fun-filled memorable stay in Southern Pines, North Carolina. Make a reservation today and save! Beefeater's: 0.80 mile(s) from Beefeater's, Bar/Lounge, Steak House, Open for: lunch, dinner, Locally owned for over 40 years. Mid-scale steak and seafood. From: The north. From Interstate 40 in Raleigh, Exit US 1 South to the Best Western Pinehurst Inn. From: The south. From 74 take exit for US 1 N in Rockingham to the Best Western Pinehurst Inn. From: Fayetteville. Take Raeford Road/401 to 211 in Raeford. Take 211 West towards Aberdeen/Southern Pines. In Aberdeen turn right on US Highway 1 and head north to the Best Western Pinehurst Inn. From: Myrtle Beach. Take 15-501 North to US Highway 1 in Aberdeen. On US Highway 1 turn right to head north to the Best Western Pinehurst Inn.